Spin This: "Faded Heart," "Bye-Bye Darling," "Iceberg," "Man"
Børns knows his talent and artistry, and it reaches a glorious bloom with ambitious explorations and solid compositions. Hardly a bad track in sight. Børns, born Michigan native Garrett Clark Borns, may be our generation’s Ziggy Stardust. His androgynous style and fashion allure pay homage to David Bowie, but vocally and musically he strays from glam rock and leans on Florence + the Machine baroque pop and Lana Del Ray atmospherics while depositing psychedelic buzzed guitar rock. When Børns goes for a dancey ditty, like on “Man,” he starts out with LCD Soundsystem programming and “Sympathy for the Devil-doo-doo-doos,” but its chorus ascends into a euphoric vocal with Florence Welch in mind as he belts “when the lights down/I want to be your man.” It feels like the best of both worlds. Sadly, the earworm of the album is tucked inside an interlude. The one-minute and a half “Tension” plays like a lo-fi disco kickstarter. If only it was actualized and expanded, it would’ve been a five-star event. Other than the absence of album personnel detail inside a set of liner notes strung together like a Harper’s Bazaar photo shoot, Blue Madonna is a twelve-track album feast that plays like a definitive rock opera, with “Bye-Bye Darling” acting as the succulent finale (“goodbye to the paperback age”). 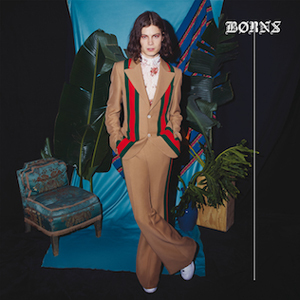 And with dreamy vocals, artsy production and a wise ear to pull styles together in a way that doesn’t seem carnivorous, a star is born in Børns.